Easily-accessible text-only (screen-reader compliant) and mobile sites. 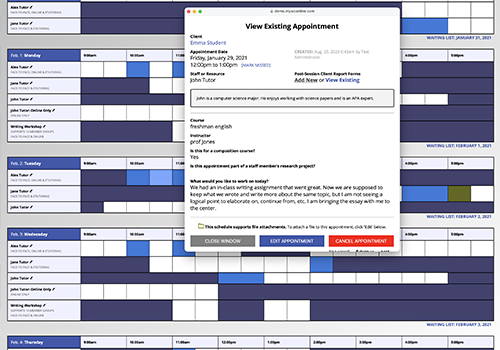 Automatic and custom appointment confirmation emails. Reminder and waiting list emails and text messages. No-show policy tracking, notifications, and enforcement. Custom demographic, appointment, post-session, and survey forms. 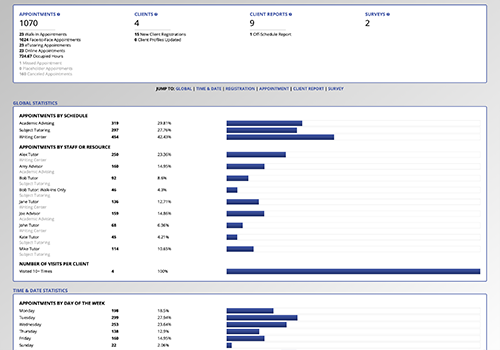 Graphical reports, including reports on center utilization data. Built-in waiting list, waiting room, card reader, and time clock tools. Easily configured single-sign-on and LDAP authentication capabilities. Group and workshop scheduling tools. Subject area or specialty "drill down" scheduling options. An online consultation module with audio, video, and text chat, drawing and math tools, and a truly synchronous whiteboard. An included eTutoring module with file upload and written response tools. 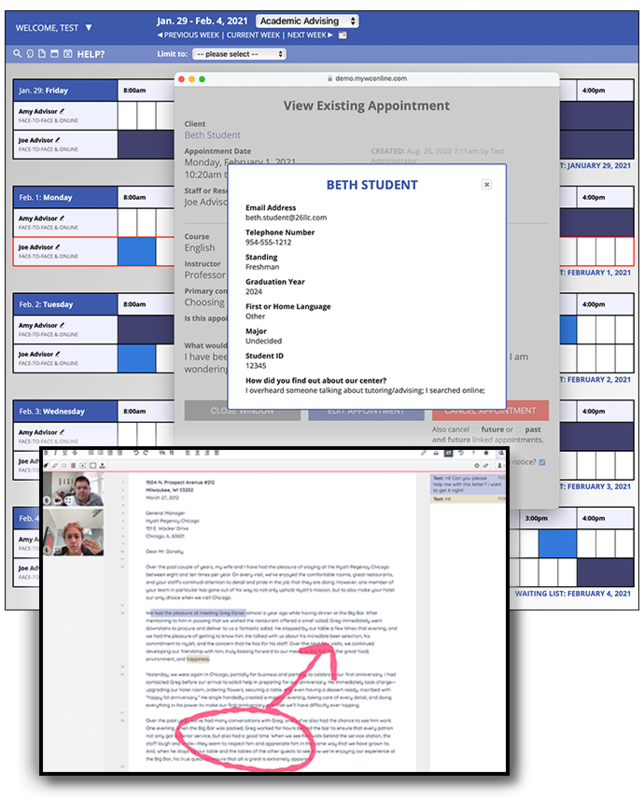 Scheduling restrictions, text messaging capabilities, mass email functions, and much more. Since WCONLINE runs on our servers, all system upgrades—including the addition of new features and updates—are installed automatically and without any additional costs. Telephone, live chat, email, and online ticketing support are also included. Our company-owned infrastructure is housed in secure datacenters, constantly updated, constantly backed-up, and continually monitored. All WCONLINE data is encrypted and only accessible through SSL connections. We've spent more than twenty years listening to our clients, learning from their needs, and watching how they interact with WCONLINE. That work has led to the development of the most user-friendly and easiest to learn program on the market, while still allowing us to provide the features that you need. You'll be comfortable using WCONLINE even before you log in--especially since all you need is a web browser. WCONLINE's license allows for an unlimited number of staff, students, centers, and schedules across a single geographic campus. Through more than twenty years, we've maintained an industry-leading uptime of 99.999% ("five nines"). We're nearly always available. We monitor how clients interact with WCONLINE and the requests that clients make and use that information to update the program. Security is our primary concern. Two separate outside agencies continually monitor our company-owned and FERPA-compliant infrastructure. WCONLINE's data is backed up constantly and both on and off-site. This means that, in the event of a catastrophic event, we're still here. WCONLINE subscriptions come with a mobile interface that provides students and staff easy access to the tools they need on-the-go. WCONLINE's text-only interface, included with all subscriptions, provides individuals using accessibility tools access to your center. Subscriptions come with complete access to our support team. You reach us via the telephone, live chat, email, or support ticket. Since WCONLINE is a subscription service, you'll always have access to the latest version and to all of the program's features. Simply put, WCONLINE allows me to do what I most need and like to do much more easily and cost-effectively [...] Most importantly, its report capabilities have helped me to demonstrate clearly our center's success and to argue compellingly for our center's needs. We're always happy to talk about WCONLINE. Reach out to us using any of the methods below. You're also welcome to take a look at our complete, searchable product manual. Another good way of learning how WCONLINE might benefit your center is to take advantage of our thirty-day, no-risk trial. You are welcome to try out every feature in WCONLINE using our complete and unrestricted demo. We've populated that demo site with fake data so that you can see how WCONLINE looks and works for a sample advising, subject tutoring, and writing center. And, we've provided a username and password that allows you to access the demo as both a student and administrator. We moved from appointments made on the phone and in person to WCOnline, and life became beautiful. We started with a very early version of WCOnline many years ago [...] In short, we have never looked back. A great product and an incredible help to us in record-keeping and in increasing our usage since. I've used WCOnline for more than a decade [... Their staff] understand and appreciate the work done in our centers, and they have tried exceptionally hard to make their service accessible and affordable. We use it for our subject and learning strategy tutoring [...] I find the analysis useful [...] Their help desk is great – real people – and the software is pretty easy to learn. Our usage more than doubled in the first semester after we had WCOnline. Just another vote chiming in that I've had very good experiences with WCOnline. Their support staff is quite helpful, and if you need to run numbers on any aspect of your Writing Center -- number of appointments, breakdowns of what classes or majors or years of study, percentage of appointments filled -- it's extremely easy. Complete, Customized, and All-Inclusive for just $715 per year!